Team Suzuki Press Office – March 2. Glenn Coldenhoff put the RM-Z250 back into the top three on his debut in yellow and black colours and across the many jumps of the spectacular and floodlight track of Losail in Qatar on Saturday. The three-man Rockstar Energy Suzuki Europe attack on the MX2 division of the FIM Motocross World Championship started in fine form as the factory-backed RM-Z250 runners relished getting back into action for the first Grand Prix of 18 this season. A modest trackside attendance entered the gates, but this novel launch to the Grand Prix trail that will visit 15 other countries, offered a different kind of racing event for what was just the second edition of the Qatari meeting. The course offered the same demands as 2013: rough, slippery and with plenty of jumps and ruts to contend with. Coldenhoff set a mean pace in Friday’s qualification heat to secure a decent fourth position and then used his choice in the gate to blast into the leading group early in the first 30 minute and two-lap moto. He battled with Jose Butron and Dylan Ferrandis and was only just beaten by Jeffrey Herlings to second position; his top-three finish representing the first for the team since the Grand Prix of Netherlands in April last year. In contention for the podium Coldenhoff was desperately unlucky to lose his rear brake shortly into the second moto. It affected the Dutchman’s chances of setting rapid lap-times and he could do no better than 12th by the finish for seventh overall. In short, a debut with promise but without luck. Julien Lieber was a welcome sight back in Grand Prix action since the early stages of 2013 when he had to withdraw at the Bulgarian round and lose the majority of the season due to a knee injury. The young Belgian was running as high as fourth in the first moto until he crashed and had to pit to rectify his clutch controls. More mistakes in the second moto led to a card of 18-13 for 16th overall. Losail was Jeremy Seewer’s first Grand Prix as a full-time rider in the MX2 contest. The Swiss had enjoyed several promising wild-card appearances in 2012 and also 2013 but the 19 year old is embarking on his maiden term at the highest level and since turning Pro at the end of the summer. Seewer was eying the top 10 after a pleasing level of speed on Friday but a succession of incidents, errors and rookie adversity wrecked his results. Finishes of 14-18 delivered a final placing of 17th on the night. Si Racha will again be the location for the second-ever Grand Prix of Thailand next week which means a short few days of travelling and relocation for the Rockstar Energy Suzuki Europe before they again find a start gate. MX2 Moto1: 1. Dylan Ferrandis (FRA, Kawasaki), 33:53.328; 2. Jeffrey Herlings (NED, KTM), +0:00.329; 3. Glenn Coldenhoff (NED, Rockstar Energy Suzuki), +0:02.209; 4. Jose Butron (ESP, KTM), +0:13.569; 5. Romain Febvre (FRA, Husqvarna), +0:13.882; 6. Aleksandr Tonkov (RUS, Husqvarna), +0:21.091; 7. Jordi Tixier (FRA, KTM), +0:26.905; 8. Tim Gajser (SLO, Honda), +0:30.193; 9. Valentin Guillod (SUI, KTM), +0:32.229; 10. Arnaud Tonus (SUI, Kawasaki), +0:36.827; 11. Alessandro Lupino (ITA, Kawasaki), +0:39.689; 12. Christophe Charlier (FRA, Yamaha), +0:40.940; 13. Mel Pocock (GBR, KTM), +0:53.373; 14. Jeremy Seewer (SUI, Rockstar Energy Suzuki), +0:53.802; 15. Maxime Desprey (FRA, Honda), +1:02.800; 16. Petar Petrov (BUL, Yamaha), +1:17.030; 17. Roberts Justs (LAT, Husqvarna), +1:23.374; 18. Julien Lieber (BEL, Rockstar Energy Suzuki). MX2 Moto2: 1. Jeffrey Herlings (NED, KTM), 33:49.169; 2. Arnaud Tonus (SUI, Kawasaki), +0:01.204; 3. Thomas Covington (USA, Kawasaki), +0:07.646; 4. Romain Febvre (FRA, Husqvarna), +0:09.683; 5. Aleksandr Tonkov (RUS, Husqvarna), +0:10.437; 6. Dylan Ferrandis (FRA, Kawasaki), +0:12.271; 7. Jordi Tixier (FRA, KTM), +0:12.453; 8. Jose Butron (ESP, KTM), +0:13.740; 9. Christophe Charlier (FRA, Yamaha), +0:14.739; 10. Tim Gajser (SLO, Honda), +0:15.526; 11. Petar Petrov (BUL, Yamaha), +0:16.126; 12. Glenn Coldenhoff (NED, Rockstar Energy Suzuki), +0:18.414; 13. Julien Lieber (BEL, Rockstar Energy Suzuki), +0:30.613; 14. Valentin Guillod (SUI, KTM), +0:31.901; 15. Maxime Desprey (FRA, Honda), +0:34.734; 16. Alessandro Lupino (ITA, Kawasaki), +0:49.114; 17. Max Anstie (GBR, Yamaha), +0:52.340; 18. Jeremy Seewer (SUI, Rockstar Energy Suzuki Rockstar Energy Suzuki), +0:53.137. MX2 Overall result: 1. Jeffrey Herlings (NED, KTM), 47 points; 2. Dylan Ferrandis (FRA, KAW), 40 p.; 3. Romain Febvre (FRA, HUS), 34 p.; 4. Arnaud Tonus (SUI, KAW), 33 p.; 5. Aleksandr Tonkov (RUS, HUS), 31 p.; 6. Jose Butron (ESP, KTM), 31 p.; 7. Glenn Coldenhoff (NED, Rockstar Energy Suzuki), 29 p.; 8. Jordi Tixier (FRA, KTM), 28 p.; 9. Tim Gajser (SLO, HON), 24 p.; 10. Christophe Charlier (FRA, YAM), 21 p.; 11. Thomas Covington (USA, KAW), 20 p.; 12. Valentin Guillod (SUI, KTM), 19 p.; 13. Petar Petrov (BUL, YAM), 15 p.; 14. Alessandro Lupino (ITA, KAW), 15 p.; 15. Maxime Desprey (FRA, HON), 12 p.; 16. Julien Lieber (BEL, Rockstar Energy Suzuki), 11 p.; 17. Jeremy Seewer (SUI, Rockstar Energy Suzuki), 10 p.
MX2 World Championship Standings (after 1 of 18 rounds): 1. Jeffrey Herlings (NED, KTM), 47 points; 2. Dylan Ferrandis (FRA, KAW), 40 p.; 3. Romain Febvre (FRA, HUS), 34 p.; 4. Arnaud Tonus (SUI, KAW), 33 p.; 5. Aleksandr Tonkov (RUS, HUS), 31 p.; 6. Jose Butron (ESP, KTM), 31 p.; 7. 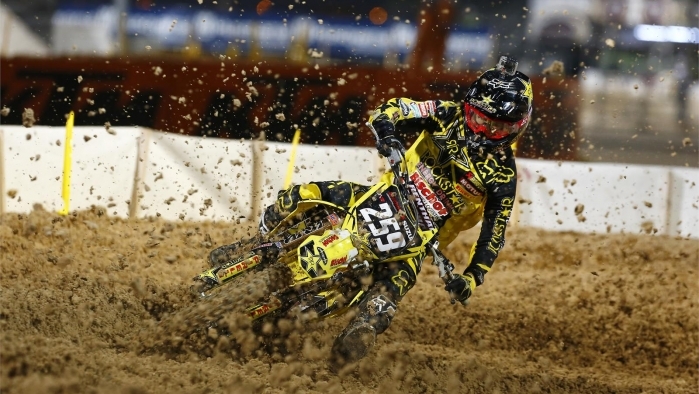 Glenn Coldenhoff (NED, Rockstar Energy Suzuki), 29 p.; 8. Jordi Tixier (FRA, KTM), 28 p.; 9. Tim Gajser (SLO, HON), 24 p.; 10. Christophe Charlier (FRA, YAM), 21 p.; 11. Thomas Covington (USA, KAW), 20 p.; 12. Valentin Guillod (SUI, KTM), 19 p.; 13. Petar Petrov (BUL, YAM), 15 p.; 14. Alessandro Lupino (ITA, KAW), 15 p.; 15. Maxime Desprey (FRA, HON), 12 p.; 16. Julien Lieber (BEL, Rockstar Energy Suzuki), 11 p.; 17. Jeremy Seewer (SUI, Rockstar Energy Suzuki), 10 p.